I have never even seen mini zucchini as such. How beautiful. The dish looks delicious! Looks good! I love hearing about your roots and the different provinces and areas of France. The nuances are so unique and all are equally beautiful! 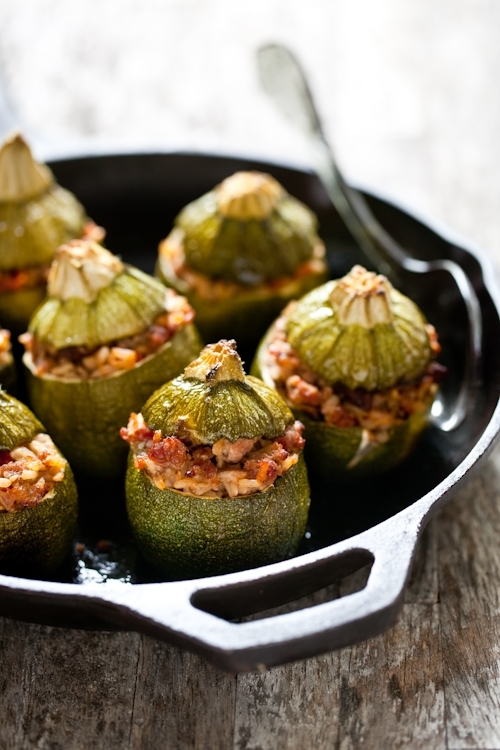 Those are just about the cutest things I've ever seen, I make many different kinds of stuffed veggies (husband is Greek) but I've never seen "ball" zucchinis before! I will keep my eyes peeled at my Farmer's Market, or do they only grow in the South? So beautiful! The beauty of your food makes each post a work of art. And the taste of these stuffed zucchini must be incredible. Thank you for sharing also about your life in France. Wow! I love your photos! Such awesome skills! Thanks for sharing! Have you ever done any vegan baking? My company, www.WholesomeChow.com, offers Decadent Vegan Cake Baking Mixes in flavors like Lavender, Chai Spice, Lemon Poppyseed, Chocolate, Vanilla and more! I made a dish similar to this last year, and planted eight ball zucchini specifically in my garden for this kind of meal. Let's hope they grow up soon! Your photos are so beautiful! I feel so relaxed when I look at them. As always absolutely amazing photos!! So inspirational, as is this recipe! The stuffing is almost identical to my mother's stuffed bell pepper. It really brings back great memories. I'm inspired to have stuffed vegetables for dinner tonight. Thanks for the great recipe and idea! *Squeeeeeeeeal*!!! It is impossible for you to NOT make food little and adorable. I now have proof that no matter what you make, it's so cute that I want to market it as toys for little children. It's not just the sweets, it's EVERYTHING ;) hee hee!! This looks so amazing! Your photos are so beautiful and have almost a calming feeling about them. 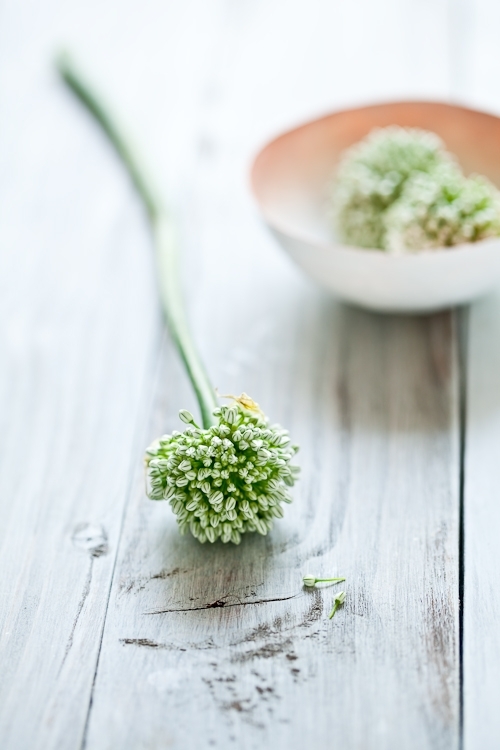 Will you be posting a recipe for the pickled onion flowers? That is all I can think about now. what a great idea with such tasty connection! How gorgeous! These look wonderful! I love all of the ingredients with the squash and am thinking of all kinds of variations based on what looks good at the markets. Your life in Charleston sounds delightful and very similar to what I think of in Provence. How wonderful to find that here in the states. How adorable! This makes me wish I planted eight ball zucchini instead of the straight long ones. Yellow ones would be pretty too! Lovely post Helen. My husband adores but I grow weary of stuffed peppers. I shall use zucchini instead! Your photography is amazing, Helen. When you tweeted about these I could not wait to see what you had done. Beautiful! You really made me smell Provence's flavour this time! These days, I'm missing your birthplace almost as much as you do! And thanks for reminding me about stuffed vegetables, which are my favourite ones in summer! How cute! I'm jumping up and down in my head, oh dear, people are looking at me funny again, I guess I did kind of jump up and down..is that wrong? I really enjoyed reading about the food preparation differences between the regions in France. I hope that I can have a little bit of Provence after I make this receipe you shared. Thanks!! these look adorable! I like that they look like portly little men with hats. I'm not fond of zucchini but I love what you put in them! It sounds as though you have a wonderful farmer's market. How I wish we had one so prolific closer to my home. However, reading your post made me very grateful for the people and nature that I am surrounded by. Love Charleston. I come often to their home tours in the spring. Think I'm bringing a group next year because we have friends who have moved there and he is opening a restaurant. 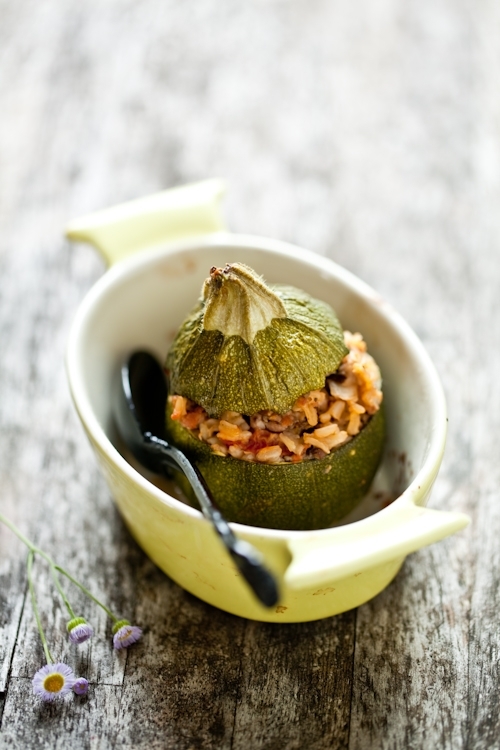 And...these provencal-stuffed zucchini are tasty little guys. With their cute hats. I stuff mine vertically...much prefer your way, horizontal. And I'll try your filling next time; it looks delicious. I live in Charleston, too--and so love getting up early for the Saturday market. Thanks so much for posting this--perhaps we'll run into each other sometime. I don't think I've ever seen eight ball zucchini - I may have to rethink my zucchini plantings this year! "I always marvel at people saying "could not eat a thing I was so sick". " I was just thinking the same thing before I read your post. I was craving for noodles and chocolate and all sorts of foods when my friend asked me how I could have an appetite despite me being sick. My answer was, "Why not?" 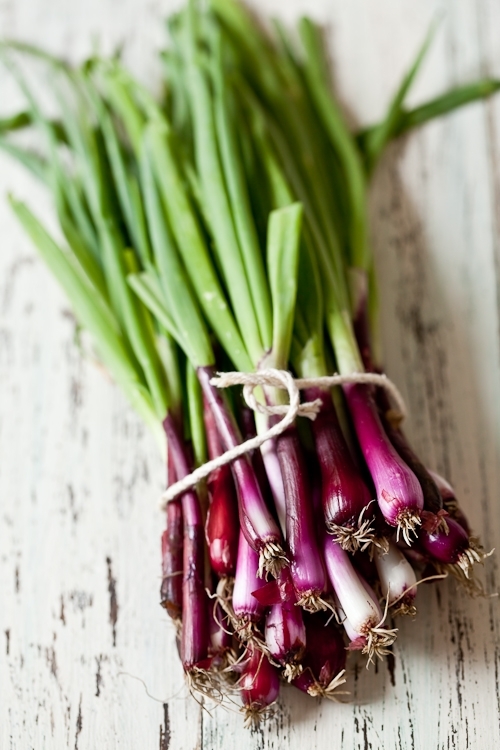 That purple onion picture is out of this world! I was wondering where I could find the link to Anita's site? I would love to look over her site too. Thanks for the lovely posts. Monica: just click on her name with your mouse, I've hotlinked it to her site. Oh I have seen these mini zucchini at my local farmers market and what a wonderful idea for a recipe! 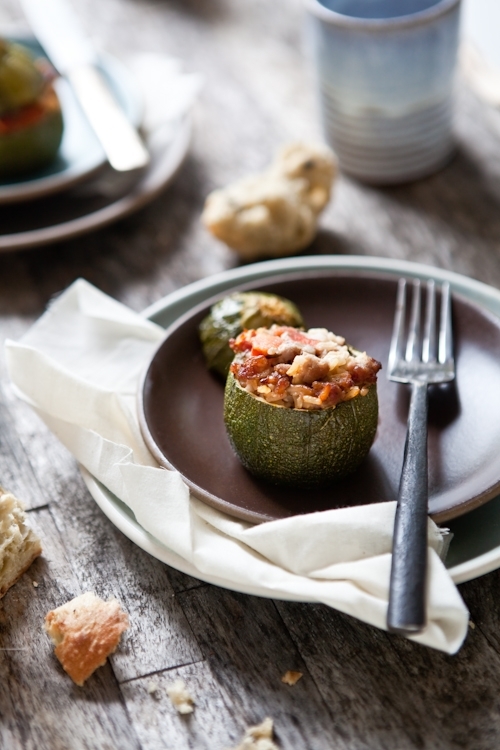 Anything mini is too cute, and stuffed zucchini sounds delicious. I can eat stuffed zucchinis (or whatever summer veg in hand you may have)every single day as well!. First time I tried it was chez mes beaux parents (they are from the Provence region as well!!) and I feel in love with this dish. Is now a favorite dish at home, and a continued tradition from my husband's heritage. These look delicious! Stuffed vegetables are always a hit. Oh, you make me so homesick! We used to stuff the tomatoes we'd get from our supplier in Apt. A lovely, stout mustached man whose stand was hidden away in an an alley, and his mushrooms I think of often. Merci Helen! Thank you for the easy and delicious recipe! In NYC, the flowers and herbs are giving way to more fruits and vegetables so I'll keep an eye out for the 8-balls. Can't wait to try this! Never seen zucchini fixed this way. Your photos are beautiful. I have been looking for little round zucchinis for a long time! They are so much easier to put stuffing in! Can I ask you where you found them!? les zamericains: at our local farmers market. 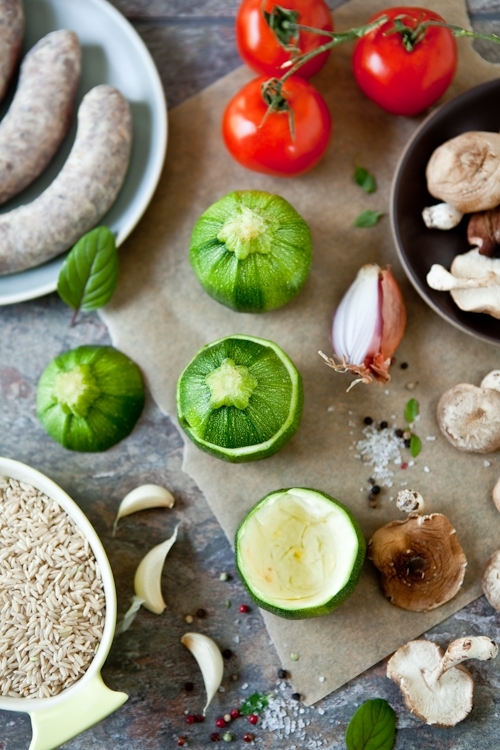 MY mouth is WATERING...they are so cute,those little round zucchinis.. I made these for dinner. *sigh* such deliciousness! I used lamb, couscous, tomatoes, onions, garlic, and parmesan to stuff. YUM!